Fighters of the Syrian Democratic Forces near Tabqa Dam. Picture by Qasioun News Agency [CC BY 3.0 (http://creativecommons.org/licenses/by/3.0)], via Wikimedia Commons.On the 5th of November 2016, the Syrian Democratic Forces (SDF) launched an extensive military operation called ‘Wrath of Euphrates’ to liberate the city of Raqqa and its surroundings from the Islamic State (IS). Raqqa is the de-facto capital of the IS controlled regions in Syria, and its fall would significantly weaken their rule. The SDF is a broad military coalition of Arabs, Kurds and other people groups in northern Syria and considers itself as a democratic defence force against reactionary forces within Syria including IS and the Baath regime. One of its principle units is the predominately Kurdish People’s Defence Units (YPG). Led by the YPG, the SDF launched its offensive to re-take Raqqa, code-named operation ‘Wrath of Euphrates’, from the town of Ain Issa, 50 km north of Raqqa. Since the launch of the operation, three campaigns have been successful in capturing big areas around the city of Raqqa and bringing it under SDF control. On March 21st, a fourth campaign was launched aimed at the liberation of the Tabqa dam and its reservoir. Just 50 kilometres upstream from Raqqa city, the dam sits at a strategic crossroads, and its capture will prove a death knell for the IS. This campaign has, as of this writing, successfully liberated large parts of the dam and encircled the city of Tabqa, liberating the Safsafha villages that surround it. The following is an interview about the Tabqa operation with ANF reporter Sinan Deniz who is based in Kobanê and is currently embedded with the SDF in the Operation Wrath of Euphrates. Why did you decide to embed with the SDF units on this particular campaign for the Tabqa dam? Well, I decided to follow the ongoing campaign to liberate Tabqa because its capture would be a crucial step in the eventual liberation of Raqqa. You see, Raqqa and Mosul are the two most important locations for the IS, and I knew this would be an important battle against a group that has not only threatened people of Syria, but the region and, really, the world. Because Raqqa is the IS’s capital, it relies on Tabqa, and specifically the dam there, for water and electricity as well as revenue. If, and when, the SDF are able to completely capture the dam, they will essentially have their hands at the levers of the whole region. I am primarily based in Kobane, a city a few hours to the north of Tabqa. But when I heard the SDF were going to launch their offensive to re-take Raqqa, in November 2016, I travelled to Ain Issa--or Bozanê in Kurdish--a small city just north of Raqqa that had been liberated by the YPG in June 2015. The SDF launched their operation for Raqqa, ‘Wrath of Euphrates’, from that village and I have been embedded with the SDF and reporting on events from that time. Then, on the 21st of March, I got wind that the SDF were about to launch a new campaign to re-take Tabqa. Knowing the importance of the dam to the region and what success there could spell in terms of a final defeat of the IS, I made immediate arrangements to travel to cover the story. The next day I travelled to the small village of Suweyda, just north of Tabqa city, where the SDF had set up a makeshift press centre. Several days later, on the 27th of March, SDF forces along with a handful of journalists embedded with them and myself, crossed the Assad lake at night by boat to the west side of the dam’s reservoir. There was a real sense of nervous excitement by all of us as the operation proceeded at lightning pace. Also, because we knew we were just kilometres away from areas heavily patrolled by the IS, and SDF forces in previous attempts at liberating these areas had come under heavy, heavy attack. After successfully crossing the lake, I stayed on with SDF forces as they worked to liberate areas west and south of the dam under IS control. I am now based in a reasonably secure location, and travel daily to the front and to some of the newly liberated areas. Whilst in those areas I try to investigate what happened in the days previous, interview fighters or civilians, and also report on how the operations are faring. Many here in Syria, as well as people throughout the world, will know that this offensive is one of the most important since the start of the Syrian war in 2011. This operation has the potential to end IS rule in Syria, and hopefully the region, and will be a significant turning point in a brutal war that has created enormous suffering. It is very important that there are journalists here reporting on the events and keeping the world updated on its developments. What is the importance of the city of Raqqa within the context of Syria today? Simply put, it is very important. The southern part of the city is situated directly on the Euphrates river and is a crucial agricultural area for the whole of the Syrian state. The city is also important related to its diversity, as though Arabs comprise most the population; Kurds, Assyrian and other ethnic minority groups also live there. Raqqa, and its surrounding areas, are also significant geopolitically. The reason for that is because it’s an industrialised region with significant reserves of petrol. With the construction of the dam project beginning in 1968, the reach of these industries increased substantially. You see, Tabqa is a dual-purpose dam, meaning that it also has a hydroelectric power station and provides electricity and well as drinking water and a substantial irrigation supply to the region. Though, the importance of the dam is also what made it vulnerable to and an early target of the Syrian opposition. The dam first came under opposition control in February 2013, and later when that opposition solidified into the IS, they utilised the dam’s resources to build up Raqqa as their capital. They even engaged in ‘dirty deals’ with the Syrian regime, their sworn enemy, selling them the largest part of the electricity generated by the dam, which became one of their chief revenue streams. Raqqa then became the economic centre for the IS as well as the base for their political and military operations. So, as you can see, this battle is all or nothing for them. If, and when, the ‘Wrath of Euphrates’ is successful, if not tangibly, but symbolically IS will be finished. Can you explain in more detail how the SDF crossed over the Euphrates? Photographs generated by the IS on social media showed fighters in parachutes. Were those accounts genuine or faked? On the evening of the 21st of March, the day of the launch of the campaign, SDF forces packed into transport helicopters, carrying military equipment, and crossed the lake just west of the dam. At the same time, and in loose cooperation with the SDF, an international coalition (IC) against the IS, launched an air attack against IS positions in the area, targeting specifically the places where the SDF had planned to land. The SDF/IC attack completely overwhelmed the IS, and their resistance was easily quelled without any loss of life. With this initial stage of the campaign realised, SDF ground forces were able to cross the river by boat the very next morning. There was no need for any forces to use parachutes, and any accounts of that are false. Can you tell us how the Tabqa campaign evolved from that point? Well, after the SDF ground forces were able to cross the lake, they immediately began liberating the towns and villages surrounding Tabqa, whilst at the same time beginning to encircle the city. The SDF attacks had forced the IS to flee and these areas were liberated without much effort. In the days that followed, the areas that came under the protection of the SDF began to stabilise, and the SDF took the decision that they could push on towards the north and west, and finally, just yesterday, they have completely encircled the town. The SDF did encounter some fierce clashes with the IS, especially when trying to capture the dam, but they overcame them and liberated the most parts of the dam and surrounding regions. The contingent of SDF forces, which crossed the dam reservoir, coming from the southwest of the city, took the airport without much difficulty. The airport had previously been used as a strategic air force base for the Syrian army before coming under IS control. Capturing this airport was just another step in destroying their hold on the region. Despite their rather comprehensive defeat, the IS continue to launch counter attacks against SDF forces, but thus far these have been deflected. What is the composition of the forces fighting the Tabqa campaign? And how involved are the YPG and YPJ? The SDF is a coalition force made up of the YPG and YPJ (Women’s Defence Units) as well as different mainly Arab military forces. The YPG/J have been involved in the SDF and this operation from its inception. From my perspective, ten days into the campaign, participation of fighters from different forces is fairly balanced between the various ethnic and religious communities of northern Syria and this composition hasn’t really changed during the campaign. I meet SDF forces from the YPG/J and other coalition partners almost daily throughout the liberated areas I travel to, and all have been engaged in the different campaigns of the operation. What is your daily interaction with the SDF like? Overall, my interaction with the SDF is very positive. Journalists embedded with the SDF remain in very close proximity to the forces—you know, we are with them at the frontlines of battles, stay with them at the military bases, and we are regularly in contact with them about the campaigns’ progress. I also find that individual SDF fighters are generally very open to speaking to the press, and their overall approach and demeanour is congenial. To me that exemplifies in many ways the ideology of the larger movement, and their strong commitment to the liberation of their people and their lands. Though the SDF are primarily a military force, what underlines that is a sincere commitment to values that had inspired the early days of the revolutionary resistance in Syria. For the YPG/J, who are more directly connected the Kurdish freedom struggle, participation in the military units is merely one feature of a popular struggle that has, for over forty years, attempted to nurture horizontalist social structures that value democracy, gender equality and a cooperative economy. And being with the fighters day in and day out, you begin to see and to realise that those values and commitments are not simply trolled out at press conferences and then tucked away at war-time. They are embodied in the culture of the units, and they inform how they interact with one another, but also with the civilians from the areas they liberate. So, I would say that their sincerity in tangible, and it creates an affable energy between the fighters and ourselves [the journalists], and really enhances the feeling of solidarity between us. It is also important to note that the SDF forces are mainly composed of people from the areas themselves, or from nearby regions. In that way, they can see themselves in the villagers and know, intimately, their struggles. This is in part why the SDF have gone to lengths to minimise any damage done to structures, especially houses in the areas they liberate. The areas around Tabqa are primarily rural farming villages, and housing structures are built using traditional methods of clay earth and wood, and are more vulnerable. But fortunately, very few structures were damaged or destroyed during this campaign. I cannot say the same, however, for Tabqa Airport which came under heavy bombardment is almost entirely demolished. Much of the airport was destroyed following its capture by the IS in 2014. But later, whatever remaining sections had endured were then devastated when the Syrian regime forces went up against the IS in the region in 2014. As fighting has basically been ongoing since then, bombed-out buildings and destroyed vehicles, planes, and roads have been left to rot. Can you tell us more about the specific role played by the IC in the Tabqa campaign? Sure, well the campaign to liberate Tabqa was executed in close coordination with the IC, made up of many countries’ forces but with the US at the helm. The IC’s contribution has mainly focused on airstrikes and other kinds of air support and with a limited number of armoured vehicles provided recently. There are no IC soldiers fighting on the ground. The air campaign relies heavily on information provided by SDF ground forces, and whenever the SDF comes under heavy bombardment from the IS, the IC is there to provide air support, artillery and personal carriers. The SDF has worked in cooperation with the IC for more than two years, and the partnership has remained militarily valuable with no serious tensions between members of the IC. How does the SDF view the success of operation ‘Wrath of Euphrates’ in terms of the military situation on the ground? The SDF see the operation as extremely effective given that they have recently been able to fully encircle Tabqa and liberate almost the whole dam and all the areas surrounding it. Though the operation took months to plan, and had to proceed with near surgical execution, all efforts have paid off and every single campaign has reached its objectives. A careful approach has proved successful, especially in light of the fact that there has been very little loss of life amongst the SDF forces and civilians in the areas. Also, as I mentioned early, destruction to property has been extremely limited, and it is clear that people from the areas support in a growing number the SDF and this operation. In fact, following the liberation of these areas, many local people have started to join the ranks of the SDF – thousands, since the beginning of the offensive. The SDF is really concentrated on liberating all Tabqa which is happening as we speak as fighters have encircled all of the city. Many in the SDF are cautiously optimistic, recognising that as we push towards Raqqa, the IS will continue to fiercely resist and will deploy their best technology to do so. Can you tell us more about the relationship between the local population and the SDF, especially considering the forces entering some of the heartlands of the IS? Yes, with the liberation of towns like Minbic, Gire Spi, Tel Abyad, Sarin—all predominately Arab—many of these local people have joined the SDF ranks. The SDF has put the figure of new fighters at somewhere exceeding 20,000. This does not include Arab populations living in and around the liberated areas of Raqqa city itself, who have also joined in thousands in the last months. Once civilians commit to join the SDF they are required to undergo a period of combat training and military education. This period is imperative, not simply for the safety of the new recruits, but also in terms of the continued success of the operations themselves, as many join with little or no prior combat experience or skills. The implementation of a period of training is also a result of the SDF’s learning from mistakes made in the past and trying to correct those—where they had seen new recruits, without enough practice in the battlefield prove weak in clashes with the IS. The considerable numbers of new recruits, as well as the welcoming attitudes of the newly liberated local populations confirm that a majority of the population supports the SDF, and their political perspective and objectives. I think it is also a testimony to just how much people have endured under the IS—both how much they suffered, but how resilient they are as well. The strength of people’s hope despite what they’ve endured remains, perhaps, the bravest aspect of this revolution. And it is the fuel that allows the political imagination to burn brightly in the hearts and minds of civilians and soldiers alike—to reach for this collective vision of a new, just and peaceful society that gets closer with each passing day. 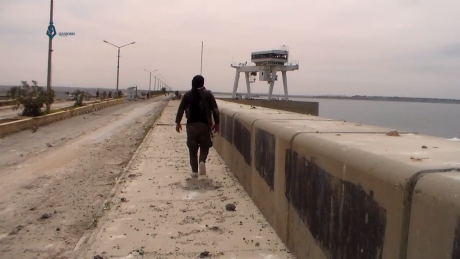 Can you tell us about the current condition of the Tabqa dam? How badly it has been damaged in the recent fighting? Yes. As I talked about before, the dam has been crucial to life in this region. In addition to supply an important amount to the electricity of North Syria, it is also responsible for supplying clean drinking water for the entire city of Aleppo! And it also irrigates many ten thousands of hectares of land, you know, it’s a real backbone for agriculture here. So, the dam is really an economic imperative, in addition to some of its other benefits, like serving as a military barrier due to the body of water that surrounds it. Due to the dam’s size and strength, whomever controls it is also able to rule the people and lands surrounding it, which was the case when it was under the control of the Baath regime and IS. However, in resistance to that, sort of, negative history, the SDF and the Democratic Federation of North Syria (which is composed for an important part of Rojava, the mainly Kurdish populated area) decided to declare the dam a resource that was to be used for the benefit of all people in Syria, and mutually and equitably managed – not, as it had been, as a weapon to dominate others. In terms of where the campaign is at now, the SDF has thus far taken control of more than half the dam, at its northern and central parts. Intense clashes over the last several days have led to a bit of a stalemate concerning the dam itself. Given the strategic importance of the dam, SDF forces have proceeded very cautiously, with meticulous efforts to limit loss of life or damage to the dam itself. Some days ago, the IS alleged on its Twitter page, that the dam was damaged after IC airstrikes, during a period of dangerously high water levels—which would have created deadly flooding in the area. However, these claims appear to be largely unfounded. In fact, the SDF commissioned an assemblage of engineers to release pressure on the dam by opening its floodgates, which it had done under heavy shelling from the IS. The SDF maintain that it is actually the IS whose attacks, especially against the engineers, have caused the most potential damage to the dam. Nonetheless, as you can see, the dam is, in a symbolic sense, a barometer for conflict. The liberation of the remaining sections of the dam will spell the liberation of the town of Tabqa, and will be a definitive turning point in this war. A few days ago, the IS again used social media to allege that they were able to use an armoured drone to attack SDF boats crossing the dam’s reservoir. Is this also IS propaganda or is it real? Yes, the photographs are genuine, and I know because I was at the boat which was the first target of this attack. Thankfully, though there was some damage to the boat, nobody was killed. The IS continued to attack SDF boats by drone, but they were not able to do any lasting damage. The SDF has since taken measures so that this sort of attack cannot be repeated. Can you describe the current situation for civilians living in the newly liberated areas? Yes, well the IS often attempt to impede the local population from leaving their homes as war approaches because they know many will side with the SDF, and even possibly join their ranks. For the last few years the IS has been feeding the local people on a steady diet of propaganda against the SDF. But people are easily able to see through the ‘alternative facts’ presented by the IS, and often approach the SDF fighters with a joy and relief that appears genuine. Many weep – they know the liberation of their village or town means an end to the fascist rule of the IS over their lives. In areas with larger populations, people walk away from the IS and towards the SDF in waves, and it’s quite a sight. The literal walk towards freedom of these people is the emblematic march towards freedom for the country. And they carry that feeling not simply in their minds or hearts, but across their faces—even their eyes smile. Meeting people whose experience concretises ideals I myself hold, and I know the larger movement here—well, it’s been some of the most moving experiences of my life. What are your plans over the next days and weeks? I plan to remain embedded with the SDF and continue to document this operation. I feel I it is my duty to be here and to document this moment in history, and continue to transmit to my people and to the world. I very much hope to be reporting soon from a liberated Tabqa town—and then Raqqa! I will remain here until I am there to witness the very moment of the liberation of Raqqa, and hopefully the closing chapter of a terrible blip in human history. We will answer its brutality and terror with the strength of our solidarity and love.